The presentations addressed topics such as lessons of education reform and development in China and U.S. educational reform efforts, curriculum reform, vocational education, and innovative teaching practices. The scope and variety of presentations provided attendees with a unique and comprehensive overview of education in China today. Similar to U.S. efforts to address inequalities in education and to equip our youth with the skills and mindsets necessary to thrive in the 21st century, Chinese policy makers and school administrators are working to improve access to quality education in the western parts of the country, to develop more critical thinking skills and creativity, and to make K–12 classroom instruction more student-centered. As part of China’s commitment to internationalize its education, all 300 million students study English, starting in Kindergarten. While the United States shares some of the same education goals, we also have similar challenges. Our Chinese counterparts are increasing funding and support of rural and minority schools, identifying new ways of engaging the community, working to make the profession of teaching more respected and with competitive salaries, and providing schools with more autonomy. Another area of commonality is providing professional development for educators and administrators. Because of Shanghai students’ high PISA scores, there has been global interest in learning more about Shanghai teachers and schools. Data from a Teaching and Learning International Survey revealed that Shanghai teachers have 62 professional development days per academic year. All new teachers participate in a multiple-year induction program that includes a mentor who is an expert teacher. This level of support requires a financial commitment, which is particularly noteworthy given that 100 new schools are built each year in Shanghai. 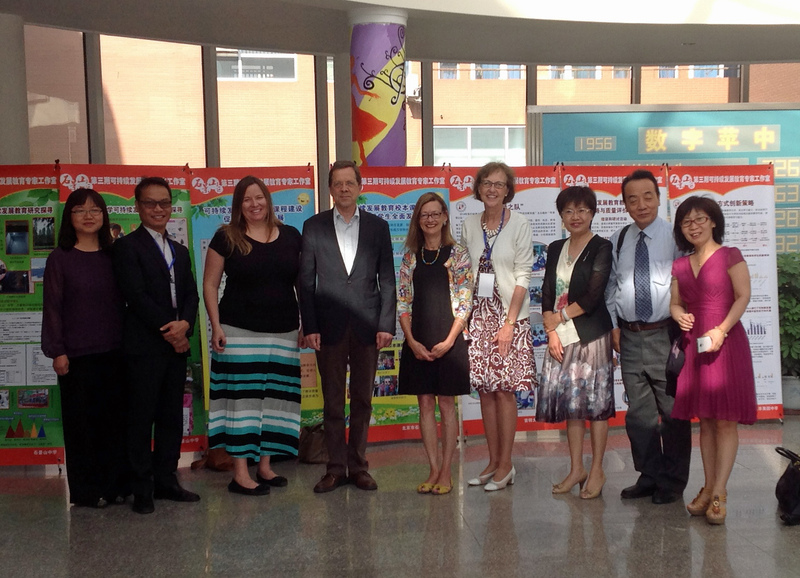 The Think Tank Dialogue offered rich learning opportunities for both U.S. and Chinese educators. Reflecting on the three days of presentations, it is clear that we have much more in common than the differences that divide us. Faye Snodgress is chairing a session on Higher Education Reform and Employment with presenters Dr. Leon Richard, Chancellor of the University of Hawaii Kapiolani Community College, Dr. Sun Cheng, Director of Vocational and Technical Education, National Institute of Education Sciences of China, Dr. Yi Li, Provost and Vice President, California State University-Northridge, and Dr. Wu Ni, Director for the Education Policy Research Center, National Institute of Education Sciences of China. 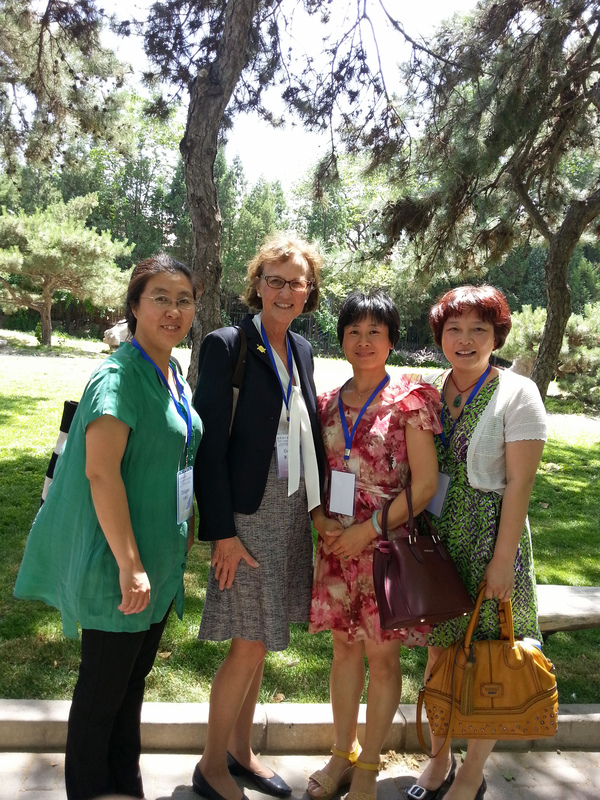 Given KDP’s commitment to advancing sustainability literacy, I met with our partner, the Beijing Association for Education for Sustainable Development (BAESD), which is interested in becoming an affiliate chapter of KDP. BAESD is involved in the establishment of a national Education for Sustainable Development (ESD) District and Green Development Exemplary District in the Shijingshan District. China’s commitment to ESD has set a good example worldwide in curriculum development, teacher training, and innovations in technology. As part of working together with educators and other countries to promote the well-being of human society, the group is interested in establishing a partnership with U.S. high schools that have incorporated either environmental education or sustainable education in their pedagogies and curriculum. Dr. SHI, Gendongi and his BAESD staff, principals, and teachers. Being in China for the Think Tank Dialogue also provided an opportunity for me to meet with two of our Chinese chapters. Members of the Far East China School chapter shared the many ways that members use and benefit from KDP resources, such as listening to and discussing podcasts, reading articles from the Record, and using the professional development resources and tips shared in emails from KDP Headquarters. Chapter members are eagerly awaiting Convo 2017! KDP Counselor Dr. Chen Xaioda proudly displays the KDP banner which will hang in the school’s conference room. The KDP Asia–Pacific Network for International Education and Values Education (APNIEVE) chapter, which was established by KDP Laureate Dr. Zhou Nan-Zhoa, is interested in expanding membership beyond Shanghai. Some new goals were established for collaboration between KDP and APNIEVE related to joint research projects and participation in exchange programs for teachers, principals, and students. An international experience such as my recent trip to China reminds me how much we can learn from talking with other educators, whether they are part of our local community or teach in schools around the world. Dr. Xiong Jianhui, Secretary-General of UNESCO-APNIEVE and KDP Chapter Counselor, joins me in showing our updated planning document. We share a deep-seeded belief that education is the path to a better life, and we strive to ensure that today’s youth are responsible global citizens who have the skills and understanding to address future challenges in an equitable manner. We are united by a profession in which we all strive to continually improve our practice to ensure that every student reaches his or her full potential. It is a small world, after all. Faye Snodgress, CAE, is the Executive Director for Kappa Delta Pi, International Honor Society in Education. How Do We Prepare Graduates to Thrive in the 21st Century? Faye Snodgress is executive director of Kappa Delta Pi. How do we provide quality education that prepares children to live and thrive in a rapidly changing world? Depending on where you live in the world, there are some cultural differences in how a quality education is delivered, but the goals are the same around the globe. From the children of Nomads in Mongolia to teenagers in Beijing, education systems are being reoriented so that everyone has the opportunity to get the knowledge, skills, values, and attitudes that empower them to contribute to sustainable development. 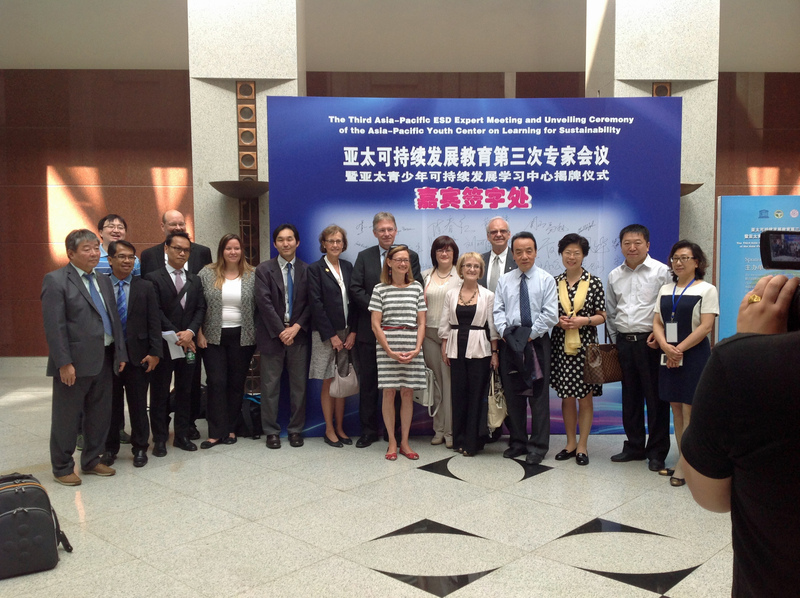 Research and case studies showing how these goals are being realized was the focus of the third Asia Pacific Education for Sustainable Development Expert Meeting held in Beijing June 2-4, 2015. Educators from the Philippines, Canada, Japan, Mongolia, Russia, Laos, Sweden, Thailand, China and the U.S. participated in the meeting. Having been invited to share the work of KDP in advancing the understanding of education for sustainabile development (ESD), I was honored to have the opportunity to learn from international colleagues who have made substantial progress in infusing ESD in their national education systems. During our two days together, we reviewed global evidence related to the successes and challenges of delivering quality education through the implementation of ESD. A common reference point for many of the discussion and presentations was the findings from a recently released research report which studied 18 countries that incorporate sustainability in their education and traditional disciplines to prepare graduates to thrive in the 21st Century. The research results provide abundant evidence that ESD contributes to a quality education and promotes the learning of skills, perspectives, and values necessary to foster and maintain sustainable societies. As is so often the case, it is through conferring with others who are doing similar work that helps us to grow professionally and be inspired by others’ successes. I look forward to using the experiences and insights of this new group of colleagues to help inform KDP’s effort to infuse ESD in the U.S. education system and to grow a widespread commitment to include the important goals of educating for a sustainable future in our classrooms. If you would like to learn more about education for sustainable development, University of Edinburg in Scotland is offering a free online course starting June 22. This five-week course requires a 1-3 hour time commitment each week. University of Edinburgh produces high quality ESD programs and materials. Learn more about the course on the Learning for Sustainability: Developing a Personal Ethic web page. Check out this month’s Member Spotlight, David McNelly! David has been a member of KDP since 2009 and is a Classroom Teacher Grant reviewer. 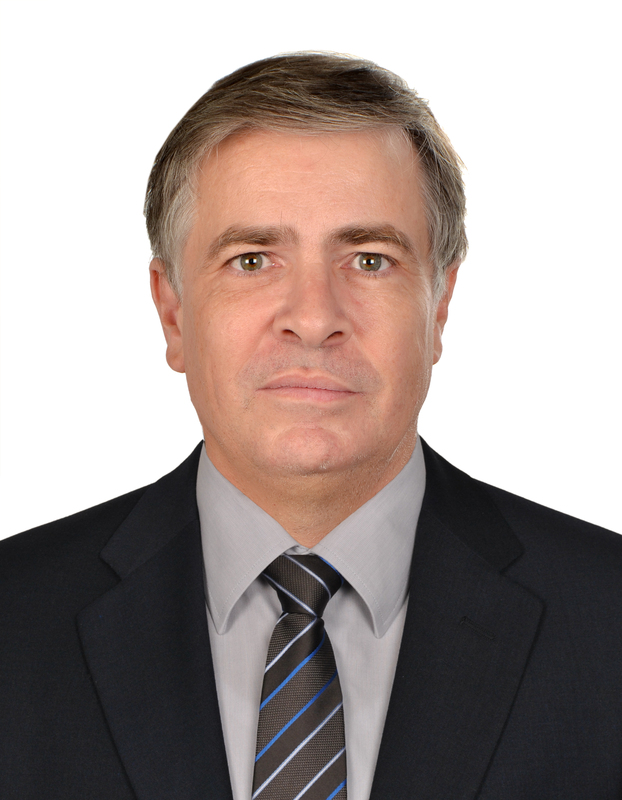 He is a Special Needs and ESL Coordinator in the United Arab Emirates. Connect with him in KDP Global. What do you value most about your KDP membership? Over the past two years, my understanding of membership has expanded and KDP has become a valued asset. Lately, KDP been a way for way to be of service and volunteer even while teaching overseas. What is your most used KDP member benefit? Articles and updates especially in the area of Special Education. I work as a coordinator in a different country at an international school with a modified American curriculum. KDP resources have become more useful as the need to stay updated has increased. Why do you use KDP Global? I work overseas in the United Arab Emirates and love to work and live in different countries. I have taught in three countries and hope to add China or Singapore to the list next year. What do you love about being an educator? A first grade boy at my school struggles with letters and numbers both due to language challenges (left to right and right to left with a different alphabet) and learning concerns. In the mornings, before school, he gets 20 minutes of free time to use the whiteboard and try to write his name. He still makes a “Z” look like a number two and transposes “I” and “U,” but he is very enthusiastic. Every day he keeps trying, and I think that is what I like most about being an educator—never giving up. Got a minute for KDP? See what’s going on at headquarters in a one-minute(ish) video. KDP headquarters will be closed Monday, January 19, for Martin Luther King Jr. Day. Registration opens this week for iLead Conferences being held in a city near you! The application portal for the People to People travel scholarships opens January 19. Register for our Jan. 20 webinar: Global Education: Best Practices with Neelam Chowdhary. Have you been looking for a life-changing adventure? How about one that will look great on your résumé? And how about one that is completely free? If this sounds like you, we have great news! 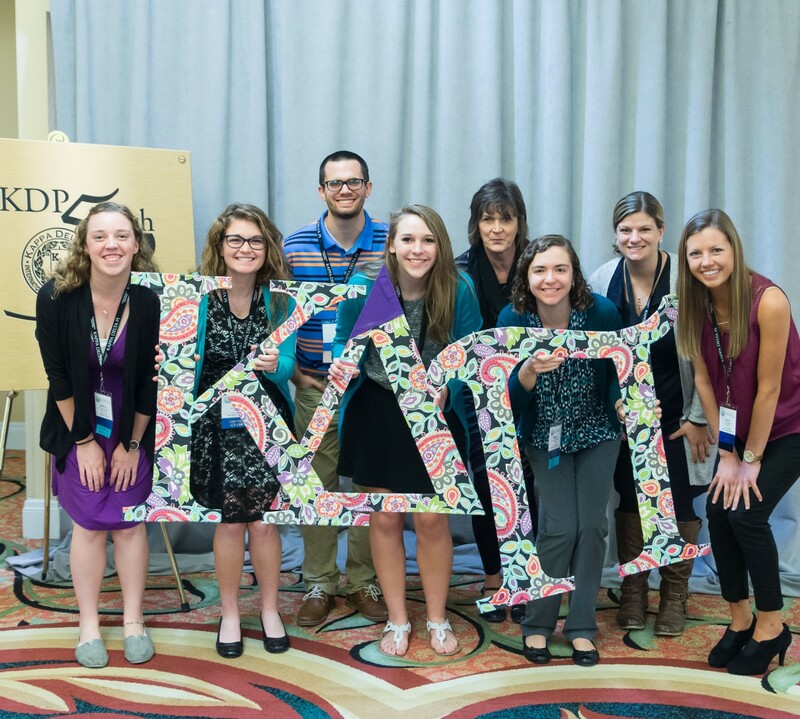 Kappa Delta Pi is partnering with People to People Ambassador Programs, one of the world’s most recognized and respected educational travel providers, on a contest exclusively for KDP members. Beginning Jan. 19, KDP members will have the opportunity to apply for one of six travel scholarships to facilitate leadership training for students in grades 6-12. This training will focus on global citizenship, leadership skills, global confidence, and goal setting in one of People to People’s Leadership Summits or World Leadership Forums. The KDP members chosen will help lead summer programs in Washington, DC, (three trips, including one to George Washington University), Boston (Harvard), or Los Angeles (UCLA), with all-expenses paid. Sound interesting? The submission portal will be open Jan. 19-Feb. 28. Applicants will need to submit a 60-second video (from your phone is fine!) and answer a few essay questions. Winners will be selected by KDP staff and announced the week of March 9. You can learn more about People to People’s programs on its website. In the meantime, be thinking of why YOU should be selected for this opportunity, and check the KDP website on Jan. 19 to submit your application! We are also pleased to announce that KDP and People to People will be partnering on international trips in 2016! Stay tuned for more exciting details. Register for our free webinar Dec. 9 for elementary educators. December’s KDP News hit email inboxes Tuesday, Dec. 2. You can check it out at any time on the KDP website. Great new blogs have been posted—a Q&A with a substitute teacher and a recap from our UN youth representative on the latest UN briefing. Check them out! Anum Khan is a member of Alpha Alpha Delta Chapter at Saint Peter’s University. 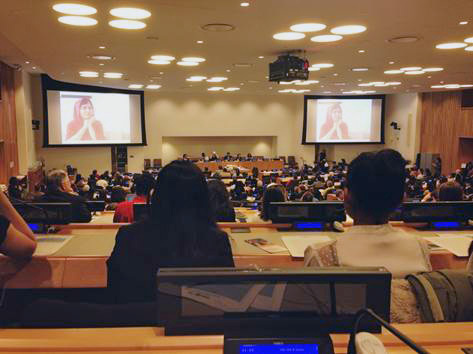 She is Kappa Delta Pi’s Youth Representative to the United Nations. Anum Khan, far right middle row, attended the November 20 UN briefing. On November 20, I attended a United Nations briefing titled “Children’s Voices in Creating a World Fit for All: Celebrating the 25th Anniversary of the Convention on the Rights of the Child.” You can watch a recording of the briefing on the UN’s Web TV channel. This briefing was very beneficial because it raised some very important questions, the most important of which was, “Are we listening?” Most adults do not take what children say seriously, which is wrong because children have the ability to make a difference. Their voice matters! As adults we have an obligation to consider the rights of children. Give children age appropriate control and responsibility for their personal care. Khan’s view from the briefing room. These points are extremely useful for educators to apply in their classrooms. It is important for children to know that they are being listened to and what they say matters. You can read more about KDP’s affiliation with the UN on the KDP website. * The Convention on the Rights of the Child is a human rights treaty, which establishes the civil, social, political, and economical rights of children.